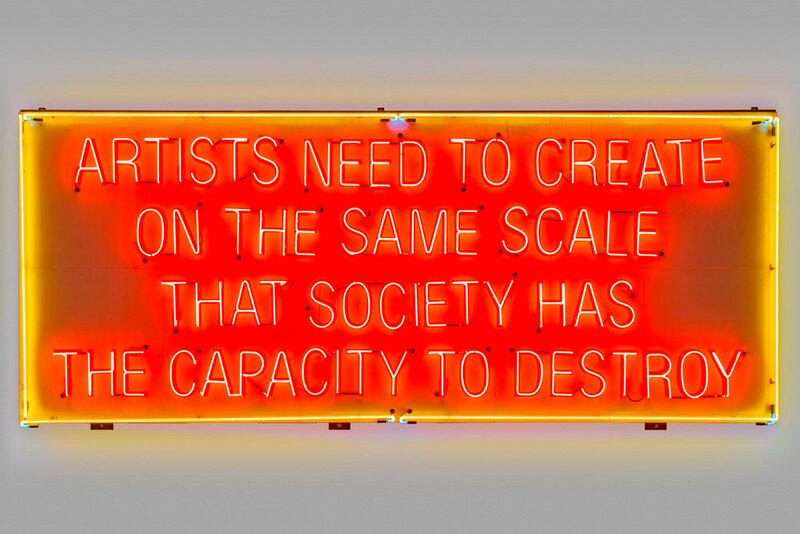 Lauren Bon and The Metabolic Studio, Artists Need to Create on the Same Scale that Society Has the Capacity to Destroy, 2006. Neon. Edition 1/12. Photo by Joshua White. March 26, 2019, Venice, ItalyOn the occasion of the 58th International Art ExhibitionLa Biennale di Veneziathe promoter the Brooklyn Rail and the curators Phong Bui and Francesca Pietropaolo are organizing an official Collateral Event that addresses the environmental crisis in the age of climate change. The exhibition, Artists Need to Create on the Same Scale that Society Has the Capacity to Destroy: Mare Nostrum, brings together 73 artists whose selected works in a wide range of media invite critical awareness on the fragility of nature and human life while poetically invoking the regeneration of living systems. The exhibition will be installed in the Chiesa delle Penitenti, an 18th-century church located in the Cannaregio section of Venice. 1001 Stories for Survival, an interdisciplinary program of free public conversations with artists, scientists, scholars, and writers, poetry readings, and musical performances that will take place during the run of the Biennale Arte 2019, from 11 May  24 November, 2019, with a pre-opening from 8 May  10 May. Positioned in the central space of the church, Wolfgang Laibs installation Passageway (2013) sets the exhibitions prevailing meditative tone as it offers a poetic rumination on the human beings fleeting journey in life. Lauren Bons site-specific installation Inverted Mediterranean Pine (2019), made of papier-mâché, and painted with carbon sourced from the recent California wildfires, is poised over a pre-existing hole in the church floor, revealing the foundation and lagoon beneath. Bons sound-scape, Oratorio Mare Nostrum, (2019), also produced for this show, connects the lagoon and the moon cycles in a layered aural map of the Mediterranean Sea. Her sculpture St. Jeromes Study (2007-2019) recalls themes of translation and obliteration, while drawing attention to the threat of oil spills on our sea. 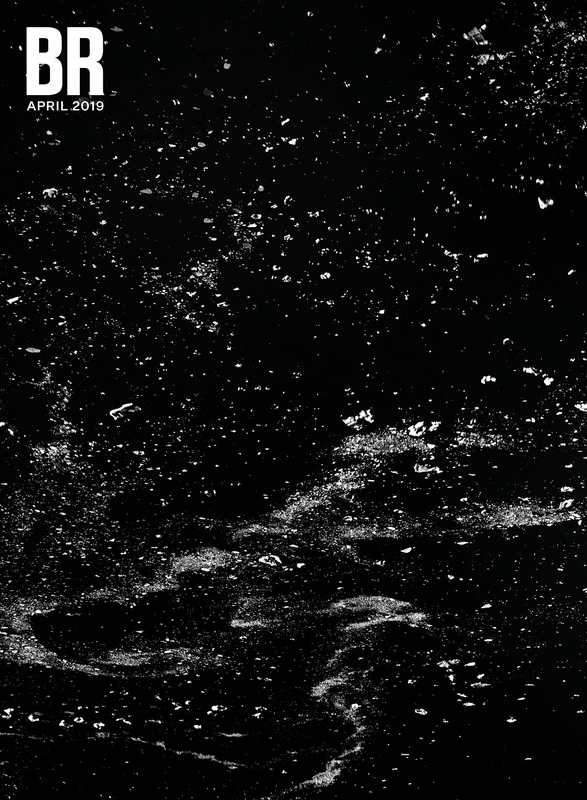 Shoja Azari and Shahram Karimis video projection on painting, Untitled: Meditation on Water Surface (2007), invokes a quiet moment of contemplation. While exploring the relationship between nature and technology, Julian Charrières new work from his ongoing series Metamorphism (20162019) poignantly amplifies the subjects of ephemerality and transformation. Shirin Neshats video Sarah (2016) creates a physical and emotional landscape, where the relationship between Woman and water is powerfully brought to the fore. 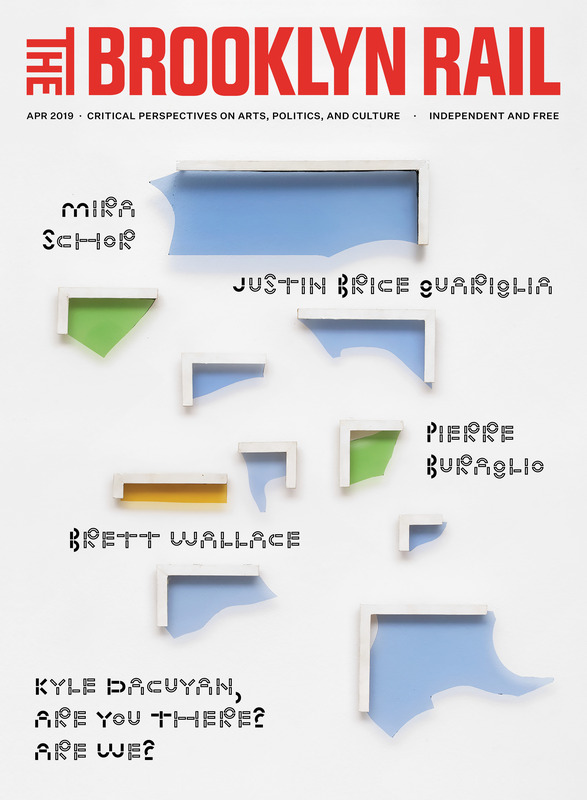 The Brooklyn Rail journala radical and free publication based in New York Citywill be present with its staff during the course of the exhibition. The Brooklyn Rail team will recreate its social environment in Venice where it will produce its monthly issues as well as an issue of the River Rail, an offshoot of the Brooklyn Rail, focusing on the condition of the Mediterranean Sea by documenting our public programming. Presented within the Brooklyn Rails working space are Phong Buis portraits In Conversation #1 (20112019), calling forth the cultural significance of creative individuals, while evoking a democratic vista spanning generations, genders, races, and disciplines, as well as The Wall of Offering: To Venice With Love (2019), an altar-like installation of paintings, drawings, photographs, and sculptures by a wide range of established and emerging artists such as Yasi Alipour, Dana Buhl, Alex Katz, Jonas Mekas, Nathlie Provosty, Ugo Rondinone, Cordy Ryman, Amy Sillman, Jack Whitten, and Lisa Yuskavage, among many others including Kiki Smith, whose sculpture of a young woman, Singer (2008), symbolically welcomes all viewers. The Wall of Offering invokes the spirit of cross-pollination that characterizes the collective energy of the Brooklyn Rail. Other works in this space include Newton Harrisons video of lectures A Meditation on the Mediterranean (2019), his Book of Lagoons (19741984), and Lauren Bons Honey Collection from the Environmentally Endangered Mediterranean Countries (2008ongoing). On view in the courtyard is Lauren Bons neon work Artists Need to Create on the Same Scale that Society Has the Capacity to Destroy (2019), from which this exhibition takes inspiration, as well as Maya Lins Water Water Everywhere, Not a Drop to Drink (2019), a site-specific installation of blown-glass dew droplets, poetically encapsulates the theme of water. The courtyard will also be animated by performances: during the opening and closing receptions (on 8 May and 24 November, 2019), Rirkrit Tiravanija, Tomas Vu, and Sarah Sze will stage their cooking performances, bringing together the local and international community. 11  12 May, 2019: A two-day discussion amongst scientists, artists, and philosophers on climate change and the Mediterranean, featuring Lauren Bon, Justin Brice Guariglia, Emanuele Coccia (Ecole des Hautes Etudes en Sciences Sociales, Paris), Jaroslav Mysiak (Euro-Mediterranean Center on Climate Changes, Venice), and Enrica De Cian (Director, Master of Research in Science and Management of Climate Change, Ca Foscari University, Venice), among others. The 58th International Art Exhibition of La Biennale di Venezia runs from 11 May24 November 2019, with a preview from 8 May10 May. Founded in October 2000 and currently published 10 times annually, the Brooklyn Rail provides an independent forum for arts, culture, and politics throughout New York City and far beyond. 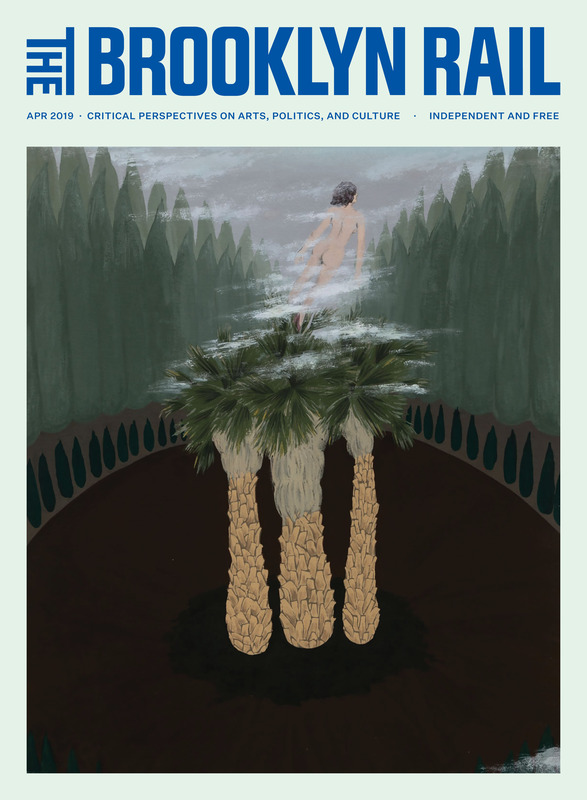 The journal features criticism of music, dance, film, and theater; and original fiction and poetry, covers contemporary visual art in particular depth. In order to democratize our art coverage, our Critics Page functions with a rotating editorship, which such luminaries as Robert Storr, Elizabeth Baker, Barbara Rose, Irving Sandler, and Dore Ashton have helmed. The Rail further fulfills its mission by curating art exhibitions, panel discussions, reading series and film screenings that reflect the complexity and inventiveness of the citys artistic and cultural landscape. Phong Bui is an artist, writer, independent curator, publisher, and artistic director of the monthly journal the Brooklyn Rail and the publishing press Rail Editions. He is a board member of the Third Rail of Minneapolis and St. Paul, the Miami Rail, the Louis Comfort Tiffany Foundation, the Sharpe Walentas Studio Program, the International Association of Art Critics United States Section (AICA USA), Anthology Film Archives, Studio in a School, Second Shift Studio Space of Saint Paul, among others. In 2013 he founded Rail Curatorial Projects, which aims to curate group exhibits that respond to location, cultural moment, and economic conditions. 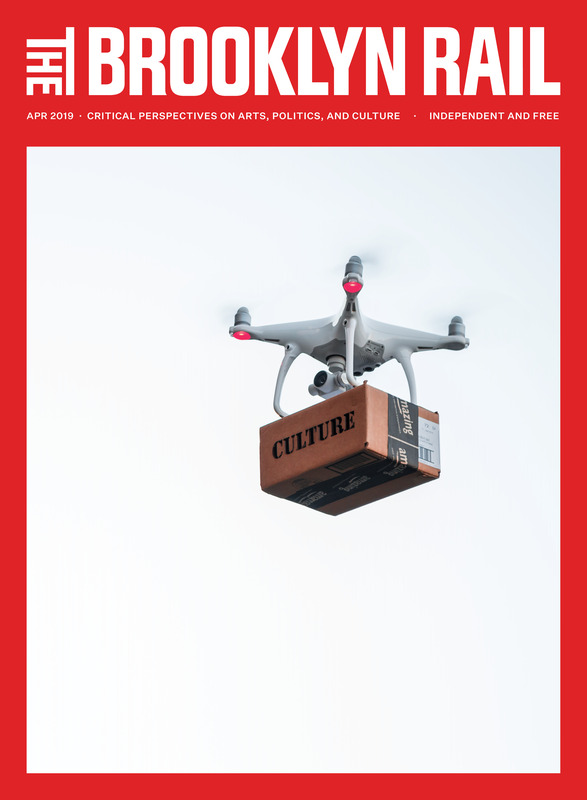 In 2017, both the River Rail (a free publication that focuses on environmental and climate change issues) and Occupy Rail (an ongoing endeavor to encourage and support motivated individuals to create their own Rail publication in their local communities) were founded to facilitate and provide critical dialogues of how the arts, politics, and culture are integral parts of the common wealth of greater public. He has recently co-founded the Graphyne Foundation, which aims to curate ongoing exhibitions and public programing in collaboration with Mana Contemporary in Jersey City, Chicago, and Miami, among other museums of contemporary art in the U.S. and abroad. His 2019 projects include: The River Rail: On Puerto Rico; and exhibitions Jonas Mekas: A Retrospective; Occupy Colby Museum: Artists Need to Create on the Same Scale that Society Has the Capacity to Destroy (Year II), among others. Francesca Pietropaolo is an Italian-born art historian, curator, and critic based in Venice. Her research interests focus on post-war European and American art, and on international contemporary art. She has held curatorial positions at the Walker Art Center, Minneapolis; The Museum of Modern Art, New York; the Fondazione La Biennale di Venezia, Venice; and the Fondation Louis Vuitton, Paris. During her time at MoMA, she worked on Roth Time. A Dieter Roth Retrospective (2004), Plane Image. A Brice Marden Retrospective (2006) and exhibitions drawing from the museums collection of works on paper. She was on the curatorial team of Greater New York 2005 at MoMA P.S. 1, New York. At the Fondation Luis Vuitton she was in charge of artist commissions, notably a site-specific installation by Ellsworth Kelly for the Auditorium as well as works by Cerith Wyn Evans, Adrian Villar Rojas, and Taryn Simon. Her projects as independent curator include exhibitions such as North by New York: New Nordic Art (American-Scandinavian Foundation, New York, 2011), and Wrinkles in Time (IVAM, Valencia, 2009). In 2015 she co-curated the international film festival Fireflies in the Night at the Stavros Niarchos Foundation Cultural Center (SNFCC), Athens as well as its second edition Fireflies in the Night Take Wing (2016). In 2017 she co-curated Only Connect!, an international program of performances, at the SNFCC, Athens presenting performances by Kim Jones, Mieskuoro Huutajat (Screaming Mens Choir), and Tania Bruguera, among others. She is the editor of Ellsworth Kelly, first issue of Les Cahiers de la Fondation (Fondation Louis Vuitton, Paris, 2014), realized in collaboration with the artist. She is the author of numerous essays in publications for, among others, MoMA, the Walker Art Center, Tate, Fondation François Pinault, Venice, and the Estorick Collection, London. She is the editor of Interviews on Art, the first collection of interviews with artists conducted by Robert Storr (Heni, London, 2017), and of its Italian edition Interviste sullarte (Il Saggiatore, Milan, 2019). As critic, she has contributed to Flash Art International, ARTnews, Art in America, the Brooklyn Rail, Art Press, and Arte e Critica.